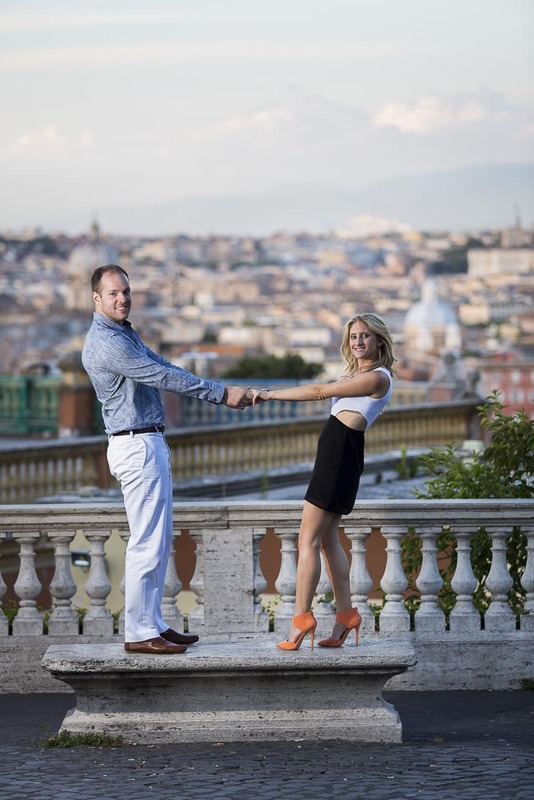 The photo shoot started with a car pick up from Hotel Piranesi in Rome Italy. Meeting up with an exceptional couple celebrating a surprise proposal which previously took place at the nearby Castel Sant’Angelo bridge [In which she said yes!]. So we had to pick this as our first shooting location! Starting on top of the bridge with a fantastic sun setting light. Then we moved down below to the Tiber river bank where we were able to focus in without many people around. Trying out different photographic effects such as silhouettes or light stars! While also taking some unique pictures of the engagement ring. 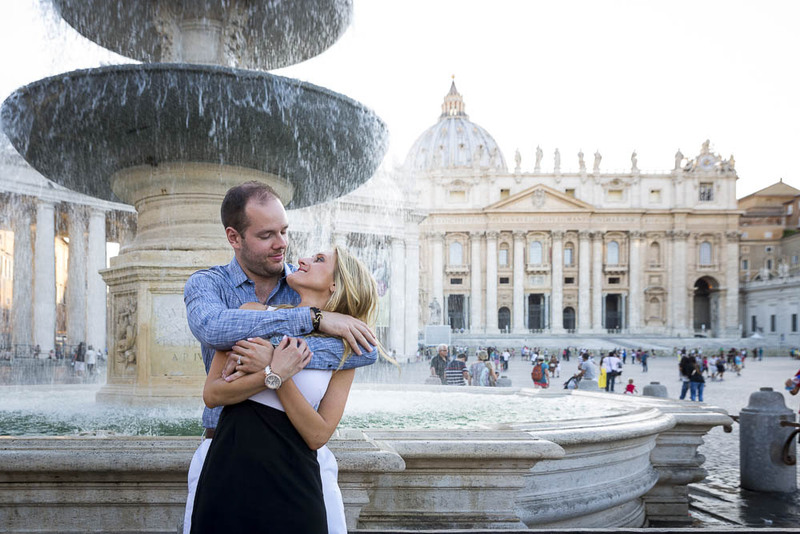 Then we were back in our trusted minvan and off to Saint Peter’s square in the Vatican to continue our Engagement Session. With some nice pictures taken by the water fountain and under the Basilica swinging then back around under the beautiful colonnade. Our next destination was the Gianicolo water fountain with a spectacular view over the city of Rome from above. The light was just perfect and we captured some nice images under the fountain and on a marble bench with the sweeping view as background. We also took another nice photo of the ring immersed in the water. Our last daylight stop was Piazza del Campidoglio providing some really nice views over ancient Rome and fun and romantic photography in around the square and environs. Sunset happened sometime during our photo session in Piazza del Campidoglio which slowly led into the Blue light. Which we were able to quickly photograph as leaving. And as reaching the Roman Colosseum which is an exceptional location to capture all the colors that compose the sky after the sun has sunk below the horizon. With the gigantic monument starting to light up. Love the fun and playful silhouette poses! As well as the contrast between the warm light generated by the Colosseum lighting from the cool blue sky. We were then led into some night time photography taken in Via Condotti where all the street lights created a nice final effect. Oh my god she said yes! Creative Engagement Photography service in Rome Italy. Going to the Most Scenic Locations at the Right Time and in the Best Light with a Fantastic Couple!